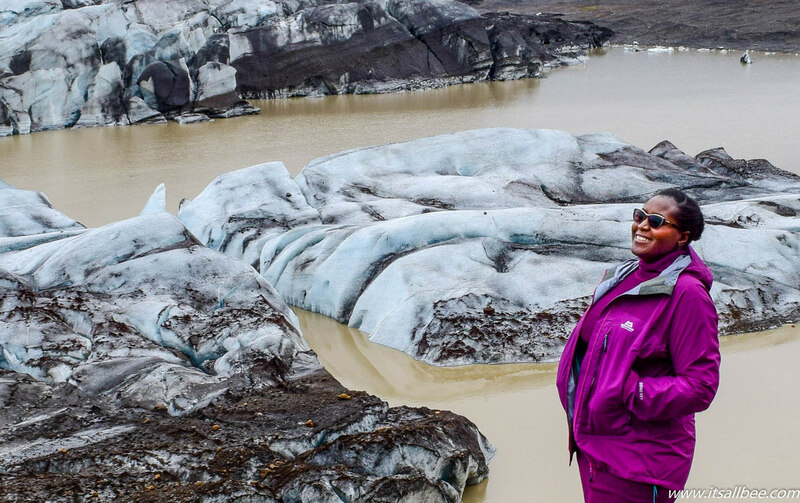 A trip to Iceland is not without checking out a glacier in Iceland. 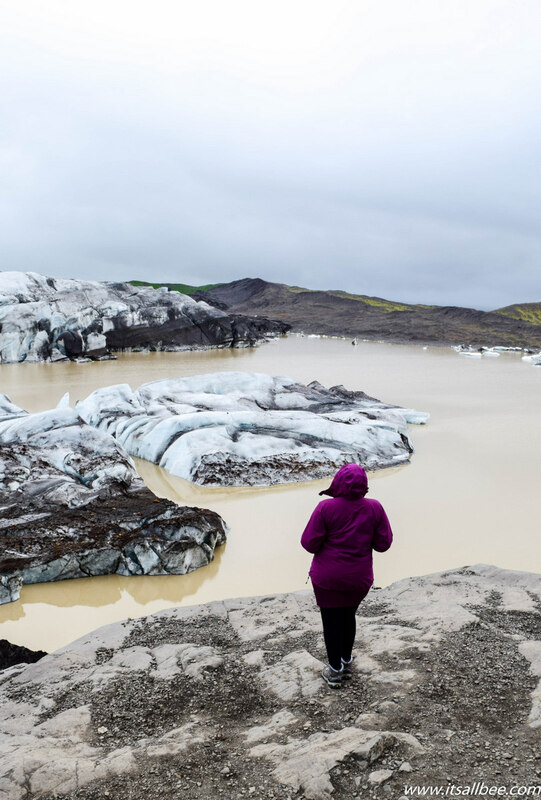 We stumbled on this gem on the way to see Jökulsárlón glacier lagoon, and with many Iceland Glacier Tours from Reykjavik one is never too far from glacier walks in Iceland. In our case running into Svinafellsjokull Glacier stopped us right in our tracks. Welcome to the land of surprises! After planning how much exploring time in Iceland we needed and reviewing our list of things to do in Iceland we thought we had our itinerary down to a T! (Scratch that! I thought I had it down to a T, I am more of a planner and Igal goes with the flow.) Then we arrived in Reykjavik Iceland, picked our campervan rental and embarked our a journey on Iceland’s Ring Road. All along thinking that we were going to be ticking off bucket list items one by one. The moment we set off, plans were in a way thrown out of the window, because of the Ring Road. No matter how much planning you do, it will throw some surprises your way in that there is so much beauty and many stops you may not have thought you would want to include in your Iceland itinerary. One such surprise was Svinafellsjokull glacier. The beautiful glacier tongue that you can spot from across the Ring Road. The call is so loud you just cannot ignore the sight. Just like Godafoss waterfall, we actually hadn’t considered, it but stumbled on it on the drive to our pinned map sights, not knowing just how easily accessible some of the natural wonders in Iceland are. Svinafellsjokull can be seen from the Ring Road. The road leading up to it is a gravel road but easily accessible. Although I imagine during the winter months be maybe quite difficult to get as close as we did. We had the places to ourselves but were soon joined by a couple of tour buses as this is a stop on a couple of glacier tours in Iceland. Located in Vatnajökull National park, Vatnajökull or Vatna Glacier as its sometimes called is Iceland’s largest ice cap and is among Europe’s largest glacier caps. The ice or snow that flows away from the main trunk of the glacier is what is referred to as glacier tongues. Svinafellsjokull is one of many glacier tongues in Iceland flowing from Vatnajokull. 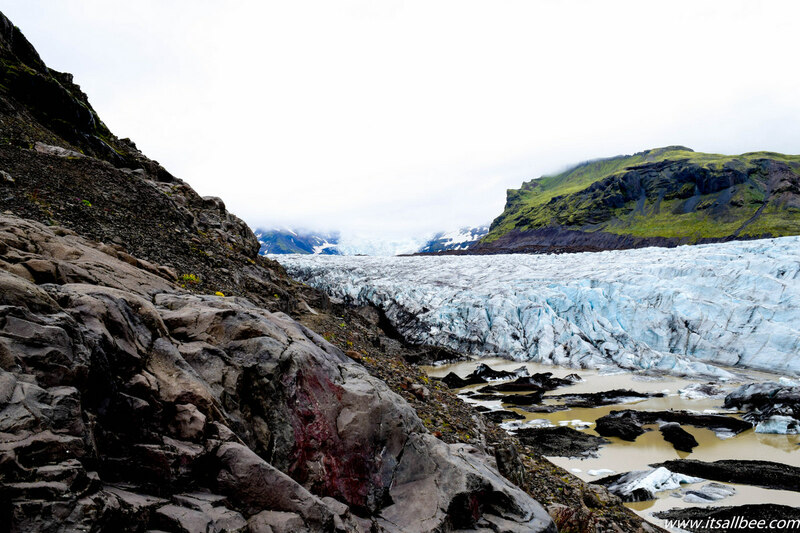 The makings of best glacier hikes in Iceland. Although the pace of the fall of ice and snow is one that may not be visible to the naked eye. Svinafellsjokull glacier in Iceland is such a breathtaking sight. You can see the beautifully shaped ice cups and the deep crevasses of the glacier and in the distance, glacier ice slowly melting into the water like marshmallows in a mug of warm milk tea and glacier walkers in the distance meandering through ice ridges on Iceland glacier hiking tours on many of the South Coast tours of Iceland and goldern circle tours. Vatnajökull national park is home to the largest glacier, that is Vatnajökull at 8,300 km square, with the second being Langjokull at just 953 km sq. It is situated in the west of the Icelandic interior or Highlands of Iceland and can be seen clearly from Haukadalur. The beauty of this place is just how easily accessible is if you are on a self-guided tour of Iceland. When we arrived here we had the place all to ourselves until the tour buses flowed in and left one by one. You can have an easy glacier walk around Svinafellsjokull. You need to come prepared with hiking shoes or a decent pair of trainers or walking shoes. If you only have loafers or shoes of that type you can still walk around but would not advise going too far out as some parts require a bit of an uphill climb on slippery rock faces. As beautiful as this place is, just remember how remote it is and don’t over do it for the ‘gram and hurt yourself. I have linked to some tours above but you can also compare prices with other glacier tours found here. Many tours will take you closer and onto the glacial ice and the crevasses, especially on the ice cave tours or ice climbing tours. They will give you and show you how to use equipment crampons, and ice axes used for hiking such terrain. If you planning on doing the majority of the exploring on your own then pack accordingly and only walk around the mountain and don’t attempt to get anywhere near the crevasses without a guide as glaciers tend to have parts that drop off into bottomless pits so just don’t do walk around that without a guide that knows the area. There are so many small group tours and glacier tours in the national pack that its not worth risking your life just for the sake of saving a few bucks. We visited in the summer but as you may know that Icelandic weather can change without warning, so pack accordingly. Reykjavik, although cold, gave us summer midnight sun and the south of Iceland had mysterious low hanging clouds, rain, hale and all sorts. You don’t have to pack everything under the sun, but picking clothes you can layer up as well as items suitable for all weather as well is my advice. I came layered up in thermals, a jumper dress, and my trusted lightweight Mountain Equipment jacket. I bought this jacket a long time ago and it has seen me through hikes inSnowdonia, Norway, and a few other places. It’s waterproof, keeps body heat well and can handle pretty much all the mountain can throw at it without being bulky or weighty and can fold into a nice little ball. So if you are going to be taking part in any Iceland glacier tours from Reykjavik or embarking on glacier hiking in Iceland, guided or self-guided, I would highly recommend you check the weather in Iceland before leaving and pack accordingly. Below is also a few items you might want to pack on your trip. If heading to Iceland in the winter, make sure you pack for the Iceland winter which can be harsh. If you want to add a little adventure to your experience of the land of fire and ice. There are at least 13 large glaciers in Iceland and with many Iceland glacier tours from Reykjavik, you can jump on a tour easily even if on a short visit. There are tours offering Iceland walks in Iceland’s Skaftafell nature reserve. This is Iceland’s second largest national park and home to Skaftafellsjökull glacier. You can do glacier hiking, easy glacier walks as well as ice climbing in Iceland glacier caves. Coming from a hot country, where the temperature can soar into the 40s. Sights like these are just so hard to imagine. I have never seen anything like this in my entire life. Then again unless you live here it’s always a first for anyone. This is one of the reasons why I love combining my city travels with adventures that take you so close to nature like this. Nature and sights like this let “You see what a tiny place you occupy in the world.” Whatever worries and cares in the world are suddenly forgotten and you are just left speechless and in awe of just how wonderful this world is and how much more of it you just need to see while you are still here. An Iceland glacier near Reykjavik, Svinafellsjokull Glacier, much like many places in Iceland has been part of a movie set. Joining the ranks of Jokuluson featured in not only one but two James Bond movies, Batman Begins and Tomb Raider. The likes of Thor, Star Wars – Rogue One, Prometheus have all been filmed in Iceland. Svinafellsjokull is where Interstellar was filmed. Getting to this beautiful movie set couldn’t be easier as its an of few glacier in Iceland near Reykjavik. You can see Vatna ice cup and it’s glacier tongue in Iceland that is Svinafelllsjokull from the Ring Road. This is jaw-droppingly gorgeous!! Glacier walk in Iceland skaftafell is going on the bucket list! Honestly I've never considered putting Iceland on my travel list but I am a sucker for natural wonders, and that is exactly what this is. Your pictures are amazing and I can only imagine that they don't do this beauty its true justice. Great post! Thanks! Yep pictures definitely dont do this place any justices. Will also ad glacier walk to skaftafell on the last for the next visit to Iceland. I've always wanted to go to Iceland and these photos are so gorgeous! Great post 🙂 Will definitely be adding glacier hiking in Iceland from Reykjavik hopefully when we visit. Yep, Iceland is definitely a land of surprises and glacier walks in Iceland are a cool way of adding a little adventure into your itinerary. I hadn't heard of that glacier, but I definitely want to check it out the next time I go to Iceland! I wonder if there are tours of Skaftafell glacier hike medium difficulty? This looks incredible! Not all glacier walks are difficult. I am sure you can find something fitting. These glacier walks in Iceland look amazing. What an epic road trip. When I make it to Iceland I'll make sure I come here! It was definitely an epic trip. I cant wait to visit Iceland again. Hope to add one of the ice climbing tours to the itinerary next time. wow! That looks amazing. I have not been to Iceland so I cant even imagine this! Fun fact that so many movies were filmed there. I had no idea! I usually head to warmer climates for vacation but will definitely keep this in mind. I guess this is probably one of the best day hikes in Iceland I have seen around glaciers. I wonder if there are skaftafell tours from Reykjavik as thats another glacier I have so much about lately. Aw this is so beautiful! Iceland is the next country I want to visit and this post makes me so excited. I just hope they have some easy hikes in Iceland. Stunning photography as always 🙂 Di you manage to visit Iceland glacier solheimajokull? Omg, such a stunning place! Definitely, have to add glacier hiking in Iceland, that or glacier climbing Iceland when I visit Iceland. If this is summer I would hate to see what winter looks like :O This is probably the best time to hike Iceland glaciers or mountains in general if this is as good as it gets weather-wise that is. Stunning is such an understatement. You have to see this glacier for yourself. Just breathtaking. Haha, can you believe this was Iceland in the summer??! lol You definitely need to see this place one day. I was in awe almost every mile we drove in Iceland. Haha I know what you mean. I wanted to do the same thing but stopped in my tracks each time I thought about how long I would last in the freezing water. Man, these are such cool pictures! Would love to do ice climbing in Iceland. Going to check out one of the Iceland glacier tours from Reykjavik. You defintely should. This was definitely one of the best glacier hikes in Iceland, easy ones I might add. You check out the many tours available. Amazing pictures Bee. Did you by any chance also do the glacier walk in Iceland Solheimajokull? I am thinking of adding that to my list of glacier tours in Iceland I am hoping to do. Max, I don’t think we got to see Solheimajokull. Perhaps next time. You are such an adventurous traveller. These pictures are just amazing. I think you may have awakened the adventurer in me. I will be adding on the the easy glacier walks in Iceland hopefully when I visit later next year. We are heading to Iceland, probably around the same period you visit. I was searching for what to what to wear on glacier hike in Iceland. Considering this was summer in Iceland, I definitely need to pack warm. It’s not summer like I know it. Certainly gives me some insights on the best glacier hike Iceland tours available. Thanks a mil! Yep, Iceland summers are nothing like I know them too but this was definitely an experience of a life time exploring Iceland. Glacier walk in Iceland of ice climb are definitely adventures not to miss in Iceland. Have fun!